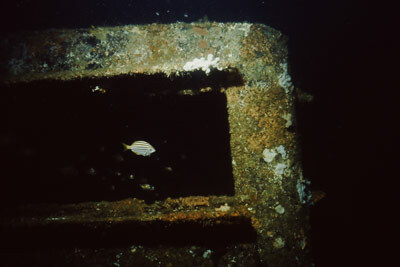 Michael McFadyen's Scuba Diving - The Trio While most of the wrecks off the Northern Side of Sydney were deliberately scuttled (see other articles) there are a couple of excellent "real" shipwrecks. One of the these is the The Trio, a large barge about 50 metres long. It is located off Mona Vale Beach at a depth of 51 metres. 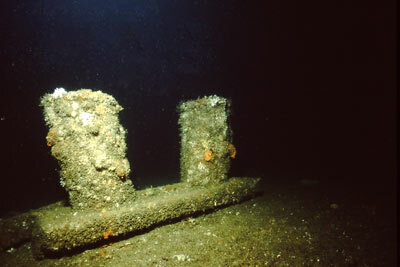 The deck of the barge sits about 5 metres off the sand. Even more interesting about the wreck is that it has a fair sized ferro-cement yacht in the middle hold. In about 1991 the yacht was in pretty good condition but today (late 1990s) it is completely stuffed. The other large rear hold as well as a smaller forward hold is empty and the steering compartment stands right at the stern. Inside the compartment is a toilet. 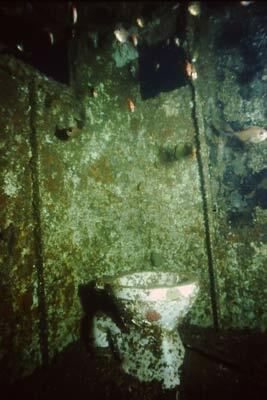 In front of the compartment is a below deck compartment. A large winch and a number of bollards are located at the bow. Just how this wreck came to be located here I am not sure. I now know that the wreck's name really was not The Trio. I still do not know the correct name, so if you do, please let me know. The story I was told is that it was being towed from Pittwater to Sydney Harbour when it sank along with its cargo. 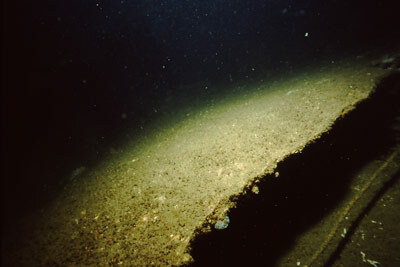 The wreck was discovered on 15 July 1988 by Bob Mansfield and two others. Hence the name they gave it, The Trio, since there were three discoverers. To find the wreck, travel about 4 kilometres north of the Long Reef wreck site towards Bangalley Head until you are two kilometres off Mona Vale Beach. GPS marks of 33° 41' 01"S 151° 21' 54"E puts you near the wreck (see my GPS Page for details). Line up the Bahai Temple (the white dome on the horizon) above the right-hand side of the top floor tower of Mona Vale Hospital as shown in the drawing at far left. Run out to sea until Barrenjoey Headland appears behind Bangalley Head as shown in the other drawing. Turn your depth sounder on and run slowly back in on the marks. The depth will be 54 to 52 metres and will come up slightly to 51 as the northern mark of Barrenjoey starts to disappear behind the Bangalley Head. Just before it is completely lost, the wreck will show on the sounder, the wreck being 46 metres. Manoeuvre over the wreck and drop anchor. Unless you drop right on the wreck you are unlikely to drag back onto it. Only worth a couple of dives every now and again. If you know any more information about The Trio, please email me. Photos scanned 2011 from slides taken in 1992 (I think).